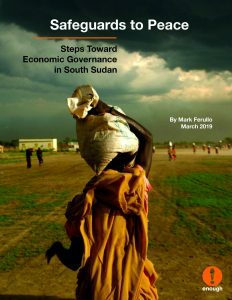 To avoid backsliding into war, a deliberate strategy is needed to address South Sudan’s weak economic governance—the institutional structure and regulations that monitor and guide the functioning of a fair, accountable, and transparent economy. Without bold and innovative reforms and swift consequences for systemic corruption, the state’s economic resources will remain the ultimate prize—one that, as years of war have proven, is worth fighting over. South Sudanese outside the leadership of the violent kleptocracy, such as civil society, youth groups, and opposition leaders, have consistently demanded an end to entrenched corruption. For South Sudanese fed up with the kleptocracy, the peace agreement is an opportunity to position economic governance reforms front and center during the implementation. International supporters should follow the lead of South Sudanese civil society and chip away at the very foundation of the country’s violent kleptocracy. Narrowing nonemergency donor assistance to support discrete aspects of South Sudan’s economic governance would limit donor exposure and help to reestablish trust in the country’s leaders. This pre-transitional period before the three-year unity government forms is a rare opening to improve economic governance—but the leaders of the Kiir-led kleptocracy will not voluntarily dismantle the infrastructure of corruption they have built. To motivate Kiir and the transitional government to stick to the peace agreement and adopt the recommendations in this report, international donors and partners should rely on financial incentives. The need to finance the peace agreement and boost the post-war economy provides international leverage to champion reforms. In particular, a coordinated international strategy should link financial assistance—which the government has requested—to the implementation of anti-corruption recommendations outlined in this report. Financial pressures aimed at altering the kleptocracy’s incentive structure should work alongside the financial incentives. Tools of financial pressure, including targeted network sanctions and anti-money laundering enforcement, should be deployed against the government and corporate actors both inside and outside the country who enable and profit from the violent kleptocracy. Until the infrastructure of the system Kiir leads is dismantled, the incentives to crater the rule of law and undermine good economic governance will be too strong. The Enough Project recommends 10 steps that would incorporate financial safeguards and economic oversight into the peace agreement. [v] These initial recommendations are not comprehensive but rather focus on specific policies that South Sudan and international supporters should jointly enact to lay the groundwork for a more transparent, inclusive, and responsive government. When combined with financial pressures aimed at altering the leadership’s incentive structure, these recommendations—which are detailed in this report—should begin to dismantle the violent kleptocracy and also support economic governance reforms that can help to prevent a return to war. [i] Siobhan O’Grady, “A New Report Estimates That More Than 380,000 People Have Died in South Sudan’s Civil War,” Washington Post, September 26, 2018, available at https://www.washingtonpost.com/world/africa/a-new-report-estimates-more-than-380000-people-have-died-in-south-sudans-civil-war/2018/09/25/e41fcb84-c0e7-11e8-9f4f-a1b7af255aa5_story.html?noredirect=on&utm_term=.83f6ba98eeef. [ii] Rachel Savage and Maura Ajak, “In South Sudan, Girls Forced Into War Face Gender Double Standards in Peace,” IRIN, January 7, 2019, available at https://www.irinnews.org/news-feature/2019/01/07/south-sudan-girls-child-soldiers-forced-war-face-gender-double-standards-peace. [iii] U.S. Agency for International Development, “South Sudan,” December 7, 2018, available at https://www.usaid.gov/crisis/south-sudan. [iv] The full text of the agreement, “The Revitalized Agreement on the Resolution of the Conflict in the Republic of South Sudan,” is available at https://www.jmecsouthsudan.com/index.php/arcss-2015/igad-hlrf-agreement. [v] While South Sudan’s oil industry is the most profitable sector of the economy, this report focuses on the economy as a whole and does not discuss control of specific resources (there are existing publications that explore ways to address deficiencies in the management of oil and other extractives). For more on South Sudan’s oil industry and ways to address corruption within the practices, please see Global Witness, “South Sudan: The Call for a Moratorium on New Oil Contracts” (June 4, 2014), available at https://www.globalwitness.org/en/archive/south-sudan-call-moratorium-new-oil-contracts and Global Witness, “Turning the Tide: Building a Clean Oil Sector Through South Sudan’s Peace Agreement” (November 10, 2015), available at https://www.globalwitness.org/en/reports/turning-tide.